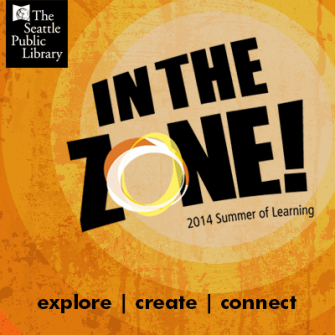 This summer Seattle Public Library has come up with 10 ideas we’d like teens to explore. Tell us about your neighborhood WITHOUT telling us its name. What do you think the future will look like? Clowns, spiders, public speaking – what’s your greatest fear? Where or when in the past would you have liked to live? What’s the worst book you have ever read? Where is the most unusual place to read a book? Create a book spine poem! What would you say in a letter to the President? For example…superpowers you may not want! Create a response post with photos, videos, gifs, drawings, songs, text, or any other way creative you want to answer. Need inspiration? Follow teenspl on Tumblr and visit your local library! Don’t have a Tumblr account? Email your response to pushtotalk@spl.org and we’ll help you get your message out there. This entry was posted in Read This!, Seattle, Summer Reading Program, Technology, Teen Powered and tagged Summer fun, Summer of Learning on June 23, 2014 by Shannon.